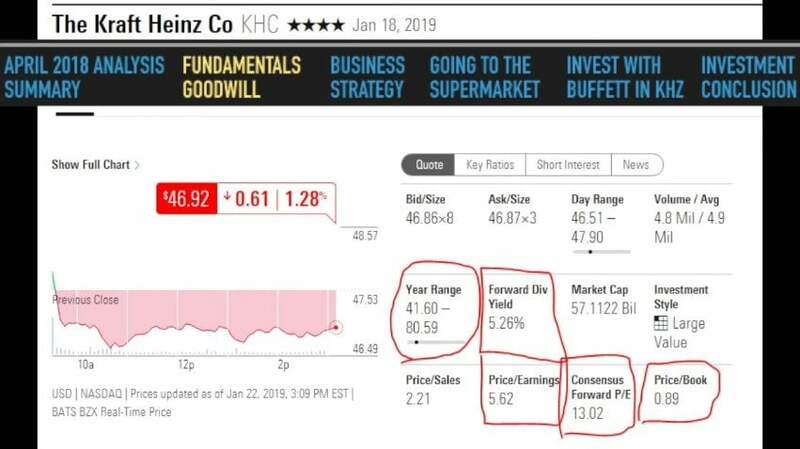 KHC Stock Analysis and Buffett‘s Investing Strategy is something very interesting but not for the average stock market investors. In any case KHC stock could be better with a larger margin of safety. Good day fellow investors. As I told you yesterday in the news today we're going to analyze Kraft Heinz which is a stock that was very much requested for me to analyze on this channel on other platform. So let's start immediately. The content Kraft stocks fundamental as the business strategy increasing dividends would make Kraft great again. I will go to the store with Kraft Heinz. You can't invest in Kraft Heinz with Buffett and my investing conclusion I have already analyzed Kraft Heinz. In April of 2008 18 when the stock price was fifty seven and in that video I discussed how the company has significant amount of that that becomes a burden as interest rates increase. How Kraft Heinz business is positioned in the middle. Whole Foods catering to the selective leedle to the cheaper and being in the middle is not that good. Hiring costs weaker brands as consumer preferences have been changing. Buffett ownership and analysis earnings forecast for 2018 was forty point eight to free. This summarizes my negative findings. Declining sales are rising interest rates input costs declining market high competition changing consumer preferences. But there were also positives cost cutting strategies. Growth in emerging markets. Strong brands high dividend yield. So my conclusion was that I will take another look at Kraft and see if it hits 41. It was 57 and it did they did hit exactly that in their 52 week low in December 2018 which is pure coincidence. But it's time to take a look another look at Kraft Heinz at the current moment. Kraft Heinz stocks is a bit higher but that doesn't really matter if the long story is strong and intact. Perhaps it will drop again depending on the market. Let's look at the fundamentals. The 52 week low 41 60 80 was the 52 week high so big volatility there high dividend for war dividend yield the five point twenty six percent temporary price earnings ratio 5 but the Forward is 14 so that should lead to a seven point six earnings yield if they pay everything in dividends. We are there 5 percent dividend yield. The price to book is zero point eighty nine. Price to book zero point ninety nine times the price earnings ratio 14 is a grand formula of what 11 12 should be below 25. So it is looks like a valuable investment. However it's not tangible book value. Goodwill is a 44 billion intangible assets of 58 billion. Together those make 85 percent of total assets. So the tangible book value is just 7 billion with seven point five billion current assets. This doesn't make a value investment anymore because everything is intangible. The liability side looks ok with current liabilities equal to current assets and stable long term debt. The long term that has always been around 30 billion. Total revenue is 26 billion. Stable for the past year stable for the past 10 years before Heinz merger so high margins signal OK it's all about the brands. They can charge more for their brands operating margins 23 25 22 percent higher in the industry high cash flows a little bit more Theil in the last years as they are investing buying their businesses buying brands. So that doesn't leave much free cash flow but OK it looks like a good business there. Cash flows have been suffering because they are focusing on growth. They want to make a turnaround. So they want to turn around the stagnating revenue for the past 10 years. They do strong marketing innovating pipeline which is not really a value investor not really something that you would say Oh great they are trying to do they are spending money to invest in growth. Now what would do well for Kraft Heinz and the constantly increasing dividend. And the question is OK Will they be able to grow or they have breached their blotto and therefore no increased dividends which might put the stock under the influence of simply interest rates. If they can hold the sales the productivity the margin is stable. This is what you can expect if there is a recession or less selling less people going to restaurants less consumption of catch up that might be also hit in forex issues things like that. Global growth wrong investment at the wrong time. That is the risk. So there is the reward. The Bronx brands are strong. But there is also the risk with such companies always best to go to the store and see OK what is going on there.